Google Remarketing – Do It, It’s Easy! Google Remarketing is an Adwords technique whereby you put a cookie on the browsers of visitors to your site, and then, when they are searching across the web, any site within the Google Content network could show them an ad for your site. Basically, it reminds your customer about you, and encourages them to come back to your site. Our clients have seen increased conversions at lower conversion costs from implementing remarketing campaigns. It is actually quite easy to set up remarketing, and you can start showing your ads as soon as you want. Follow my simple steps. 1. Create a new campaign for your remarketing, which should be opted into the Content network only. It should also specify “specific reach” under the display network options on the settings page. 3. Click on ‘New Audience’ then ‘Remarketing list’. This is where you create an ‘audience’ for your content network campaign, which is going to include only people who have visited your site. 4. Choose a membership duration. This is where you choose how long you want each visitor to your site to remain in your remarketing ‘audience’. It can be up to 18 months, but this is probably unnecessary for most sales cycles. Keep in mind that if you make it the longest period, this might make the campaign the equivalent of a normal content network campaign, NOT a remarketing campaign, which is intended to remind people about a recent interest. 5. The audience will be assigned a piece of code which you need to put on your site. Note that you can put it on every page of your site, OR you can put different audience tags on different pages (e.g. so you can have product-specific remarketing audiences seeing targeted ad copy). 7. 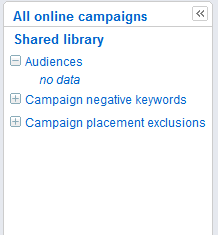 In your new campaign – create a new adgroup, then go to the audiences tab. 8. On the Audiences tab, Click Add Audience, then choose your audience from the ‘Remarketing lists’. If you want to combine lists, choose ‘Custom Combinations’, then click ‘new custom combination’ from the bottom of the table. (e.g. if you want to exclude one list, or include more than one list, etc). 10. Remember to regularly check the costs and sites where your ads have shown, so you can optimise the campaign. 1. You don’t need to be running any other Adwords campaigns for remarketing to work. 2. It will only target people who have already been on your site, no NEW prospects. 3. Closing a list in your audience tab means that no new people will be added to your remarketing list, but it doesn’t mean your ads will stop showing. To do that, you need to pause the campaign, ad group or ad. 4. You don’t need to have keywords, placements or other demographic targeting on. This will restrict your traffic.